The UFC’s biggest drawing card Brock Lesnar went down at UFC 121. While Dana White may have lost his biggest draw, what if he gained his most elusive obsession out of it? Could Lesnar’s loss be Fedor Emelianenko’s gain? Dana White has openly admitted that he has been obsessed with signing Fedor Emelianenko. Of course this was before Fedor’s loss to Fabricio Werdum. Following the loss Dana White said at a UFC press conference that he no longer had interest in The Last Emperor. If you believe that, I have another James Toney UFC fight I’d like to sell you for $44.95. Dana White has been chasing Fedor Emelianenko for the last year and a half. White thought he sealed the deal with a reported $30 million deal with Fedor. Instead, Fedor shocked the entire MMA community when he turned down that deal for a reported $100,000 deal with Strikeforce. The conclusion was fairly obvious to even the biggest Fedor fans. Fedor was afraid of Brock Lesnar. A lot has changed since the summer of 2009 when Fedor signed with Strikeforce. Fedor has one fight left on his three fight deal with Strikeforce and reportedly also has one fight left with M1 Global or who Dana White lovingly refers to as “those crazy Russians.” Strikeforce and Fedor appear to be at an impasse since nothing has even been close to being signed for Fedor’s last fight. All reports indicated that this relationship was close to falling apart going as far as back as immediately after Fedor’s first fight. There is a real possibility here that Fedor will never fight in Strikeforce again. Dana White made some headlines a few months back when asked about Fedor. White shocked people when he intimated that he had recent conversations with Fedor’s management about coming to the UFC. In all fairness, White could have been just having fun with the rumored problems between Strikeforce and Fedor’s camp and may have had no conversations at all. On the other hand, White seemed to indicate that Fedor was not under contract to Strikeforce by saying he never negotiates with contracted fighters, while leading the reporter to believe that he had recently negotiated with Fedor. Let’s fast forward to the present. Brock Lesnar has been exposed by Shane Carwin for having a weak chin and a subpar stand up game. Cain Velasquez easily took advantage of this and dominated the champion. The book is now out on Lesnar and if there is anyone that can take advantage of a weak chin, it is Fedor Emelianenko. All of the sudden he matches up much better against Lesnar. If all that was standing in the way of Fedor agreeing to a UFC deal was his fear of blowing his win streak against Brock Lesnar, well that fear is now over. Dana White has also said that if Fedor Emelianenko came to the UFC that he would get an immediate UFC title match. Now that could change being that Emelianenko did lose, but my hunch is that White would acquiesce to sign Fedor. Fedor Emelianenko matches up much better against Cain Velasquez than any of the bigger heavyweights. The jury is still out as to whether Fedor has lost any of his speed and/or reflexes with age. However, if that isn’t the case there aren’t many other fighters that match up better against Velasquez than Fedor Emelianenko. The other thing to consider is that both parties need each other a lot more than they did a year and a half ago. Dana White is looking at a heavyweight division with only one guy that remotely matches up well against his champion and that fight is already locked in. 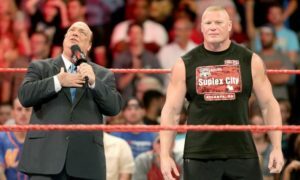 If Lesnar loses one or two more fights he very well could take an extended leave of absence. Also, if Lesnar does a rematch with Velasquez where would he go from there? A Fedor vs. Lesnar fight is a guaranteed bonanza whether either fighter is coming in on a losing streak or not. Fedor is 34 years old, just lost his first fight in 10 years, is close to burning a bridge with the only other American fight promotion that can remotely afford him, and his next deal is likely his last. Why wouldn’t Fedor want to take a last big pay day and take a fight with a champion that he does match up well against? It is a no lose situation for Fedor now that he has gotten the monkey off his back of his first loss. I can understand Fedor choosing legacy over money, but now that his streak is off the table why not cash in and expose your brand to the biggest MMA audience in the world? It seems like such an obvious marriage that it probably won’t happen. It seems we walk down this path once every few months only to have our hearts broken by “those crazy Russians.” However, I think there are so many variables that have changed that if it doesn’t happen or after Fedor fulfills his Strikeforce contract that I would be shocked if it doesn’t happen.